Tannery Brushes | Industrial Brush Company, Inc.
Chinese pig bristle, "Boars Hair" is the very best bristle available for Leather Seasoning applications. Our seasoning brushes contain 100% Chinese bristle wound with a super density which guarantees superior leather seasoning as well as streak less brushing. Industrial Brushes are preferred by tanners because they do not shed. This added advantage eliminates costly manual after-wiping of hides. 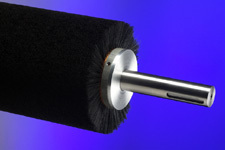 Industrial Brushes are used throughout the tanning industry for Bolster washing, tough heavy-duty plate washing, buffing and dusting off applications. 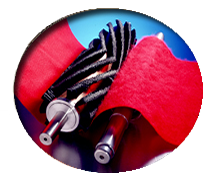 Each brush core is manufactured using stainless steel components to combat the effects of corrosion. The cores are dynamically balanced at operational speed to ensure vibration-less performance. Our "Tufted" bristle pattern chemically bonds groups of bristle in a staggered pattern to our metal core. This provides a unique action which yields a long life and consistent quality due to its density and even bristle distribution. Because seasoning brushes do become contaminated and wear quickly, our brushes are designed to be striped and re-bristled to their original "like new" condition whenever they become worn. Cores are carefully examined for shaft wear, core straightness, and balance. Repairs are made and new bristles are applied.